On the calm green depth of the Bay reposing. To the Stranger in Douglas. With the view to add another string to the Lyre of the Stranger’s enjoyment, and contribute to the fund of the imaginative felicity, of those accomplished circles who make “Walking on the Pier” a part of their amusement, the Author sends this trifle into the world. — The style is simple, equable, and unambitious, but the subject in itself, and independent of the writer, is sublime. The Pier is, indeed, but a diminutive though an invaluable gem. Like a solitary snow-drop, it endeavours to escape observation amidst the waste in which it smiles. Though its beauty be of the most attractive kind when laid open to view, the flower is so small and retiring, that many Strangers pass over the spot where it grows without seeing it. It is, in fact, a Picture, or, rather, a Miniature, touched by the pencil of a Fairy. It would make a delicate subject for Ariael to paint in the tender leaf of a cowslip. No! no Artist could possibly do it justice, but he who paints in words, to the soul as well as to the sense. But, notwithstanding, as every Stranger will here find subjects suited to his taste, the Author hopes that his little book will merit a favourable reception amongst the lovers of the Pier, and that it may ultimately become the popular “Forget Me Not,” of the Isle of Man. HEADS OF THE MARINE POEMS, &c.
Fugitive Lines descriptive of Douglas, the Pier, and the Bay. A Morning Visit to the Pier. Hymn to the Sun, as seen rising from the Pier-head. Address to the Ocean on perceiving it in a state of agitation and beating against the Pier. Lines to Douglas Bay, occasioned by noticing the excessive transparency of the waters immediately under the Pier. Visit to the Shore under Mona Crescent. Reflections on Mona Castle, on the Beach of the Bay of Douglas. A Ship’s Departure from Douglas Bay. Lines on the Loss of a Ship. A Sonnet, on observing the Bay in a Calm from the Pier. The Storm, or Wreck of a Vessel under Fort Anne. Sun-set, viewed from Fort Anne close to the Pier-head. Evening Ramble round the Bay of Douglas. Stanzas on a View of the Sea from St. Catherine’s, the Cottage of J. C. Gelling, Esq. Lines on a Lady Bathing in the Bay. A Night Scene at Woodbourne, the Villa of Thomas Harrison, Esq. The Ocean, as contemplated from the Marine Villa of Robert Steuart, Esq. The Bird of Passage passing over the Pier-head. The “Great Deep,” as viewed from Bemahague, the beautiful Seat of Deemster Heywood. Address to a Steam Vessel. The beautiful Valley of Glenmay. Descriptive of Douglas, the Pier, and the Bay. What varied charms to thee belong! And sternly o’er the ocean frown! And braved his rage in every form! They flow, and constant homage pay. In summer calms, in winter storms. The mariner from a watery grave. And lull the anxious soul to rest. Till earth, and seas, and skies decay. MORNING VISIT TO THE PIER. Calling a new creation into light. And Phoebus spreads his all-refulgent beams. Fill with wild harmony the woody plain. Frisks round its dam, and, raptur’d, bleats its joy. Disportive play the tenants of the flood. Its hopes and fears, its pleasures and its pain. On seeing it distinctly rise from the Pier Head. Trembling and pale, upon thine ancient brow. And all the wide seas drink them far and near. And there is glory on the slumb’ring deep. Glows on the winding streams and woods below. Cold sea lie calmed beneath that gliding horn. The eastern mountain tops upon! That speak the coming of the bridegroom Sun! And upon fresh’ning branches glad birds sing. Dreading that fervid eye, and its sure scan. Sing rocks and mountains, plain and sea! Hail to more perfect beauty — hail to Thee! On perceiving it agitated and beating against the Pier. Who owns his Saviour’s, and thy Lord’s controul. With mine, shall sink in everlasting rest. Thou sea immeasurable, and deep profound? Hark to the final Trumpet’s awful sound! Hush’d thy wild waves, and gave the whirlwind peace. Yield up thy countless tenants from the tomb! Occasioned by noticing the excessive Transparency of the Water immediately under the Pier Head. Before the rising breeze, and all is fled. Like thine, sweet, sweet Bay — fair, but fleeting too. On visiting Mona Crescent, near Douglas. For there is music in its wildest roar. Or, rock’d by whirlwinds, on the surges sleep! What stores of wealth, unknown, oblivious lie? With kindling lustre, hid from mortal eye? Their lonesome grave, the huge abyss below? Unheard, the woodland warbler pours his strain. And friendship’s accents all unheeded flow! When dim the eye that languish’d forth a soul. The quenchless remnant of an unfed fire? In splendour lost amid perfection’s day! And sing with Angels to the harps above. On the Beach of the Bay of Douglas. Yon lovely abode is the seat of Duke ATHOL. Are nightly encourag’d by Ocean’s sweet murmur. And the billow, as gentle, that dies on the shore. To cherish that quiet my spirit enjoys. Borne along by the ebb or the flowing of tide. All health to their Graces who claim this abode! And joy to their bosoms on life’s chequer’d road! Long, long may they live to inhabit the place! When the Poet and Parents can visit no more. May this form repose as near Ocean’s mild murmur. From Douglas Pier and Bay. And the sun in sparkles flashes o’er it. Their gaze intent when out of hearing. Heaven send them fair and gentle weather! To a distant land, o’er the ocean going. THE SHIP’S RETURN INTO DOUGLAS BAY. For silent are the tears I shed. By thee my devious course was traced. And in thy safety was my rest. No more a welcome asks of me. Had still beguiled with hope’s sweet song. And peace his guileless soul possessed. And dreams illumed each passing day. Were all the joys he sighed to taste. As none had ever soothed his own. Rich with affection’s balmy breath! That gilds the dark hour of death. His pangs — one moment he was blessed. Responded to the father’s name. The latest counsels of his heart. His parting sigh a wish untold. That Bark was never heard of more! Say, Were they quenched in waters cold? For she was never heard of more! Of racking cloud and rolling sea? When drifting on a fatal shore? Is dark — she ne’er was heard of more! Her fate — she ne’er was heard of more! And ne’er was seen nor heard of more! Comparison between the Steam Boats and the sailing Smacks that frequent Douglas Bay. Thy best and wisest plan’s to go by Steam. To pay maids, waiters, and somewhat to boot<.em>. With all that’s low in language and in life. And passengers who will not sleep, must read. So well as vessels fitted with good sails. Cause sudden starts of momentary fear! Potatoes only claim thy humbler care. Nor handed her a chair, and brought a pillow! Should make a woman look so interesting. ‘Gainst Beauty’s smiles successful who have striven? My Bark’s at Liverpool; and so adieu! My song and subject cease together there. Where is the Prophetic Spirit to declare? We yet may manufacture POEMS by Steam! On Observing the Bay in a Calm from the Pier Head. Like the low-whisper’d vows of timid love. Flash’d on my mind, and woke luxurious tears. On seeing a Vessel sink between the Pier Head and Fort Anne. And leaves the spray foaming behind. And wide opens the yawning abyss. ’Tis over, — she sinks — and they die. On Viewing the Wreck Alluded to in the Preceding Lines. What hid’st thou in thy treasure-caves, and cells? Thou hollow-sounding and mysterious main! — Keep, keep thy riches, melancholy sea! We ask not such from thee. Far down, and shining through the stillness lies! Won from ten thousand royal Argosies. — Sweep o’er thy spoils, thou wild and wrathful main! Earth claims not these again! Above the cities of a world gone by! Sea-weed o’ergrown the halls of revelry! Man yields them to decay! Yet more! the billows and the depths have more? High hearts and brave are gather’d to thy breast! The battle-thunders will not break their rest. Give back the true and brave! And the vain yearning woke ’midst fatal song! — But all is not thy own! — Yet must thou hear a voice — Restore the Dead! — Restore the Dead, thou Sea! On the Shore of Mona Crescent. Or to old Ocean’s ripplings ever new! Move calmly o’er the Ocean’s mighty breast! To raise the sail which gentlest breezes foil! Oh! may this softness mark the close of mine. Observed from Fort Anne, close to the Pier Head. The realms she leaves behind. Are shadowing o’er the scene. And Life a weary dream! Were scattered round and shining there! With them, and on the strand. The lark’s strain rich and wild. Dry up — or fall away. For me, when far from shore! On a view of the Sea from St. Catherine, the Cottage of J. C. Gelling, Esq., at Kk. Onchan. To me, there’s more than music in thy roar. When Paphia, thy sweet daughter, rules on high? And war and woe the “HOLY TREATY” ends! To hate the more when frowns her brow deform. And hearing bravely all their chilling shower. Ten million hosts to thy tremendous roll? ’Tis formless, viewless, voiceless, dark and vast. For ever flowing, yet for ever full! Witnessed from the Windows of Mr. Dixon’s Crescent Hotel. And with quick step ascend the cover’d dome. And round her, zephyr all his sweetness breathes. And drest in careless haste she leaves the tide. First rising from the em’rald wave was seen. The Villa of Thomas Harrison, Esq. of the House of Keys. And the twilight’s faint visions have fled. And the music that flowed from the spray. As the shadow of things that have been. Where the Bay’s gently kissed by the gale. With the splendours effulgent on high. May benevolence glow in my heart! As contemplated from the elegant Marine Villa of Robert Steuart, Esq. Without a grave, unknelled, unconfined, and unknown. Obeys thee: thou go’st forth, dread, fathomless, alone! On seeing one fly over the Pier in the month of October. Of winter’s stern approach to tell. Around the forest’s russet gold. This Isle is now no home for thee! And seek elsewhere the smiles of spring. For those sear hills whose heath he leaves. Who made his summer home so dear. If friends are near, that place is home. If those we love are still beside us. As viewed from Bemahague, the beautiful Seat of Deemster Heywood. O thou vast Ocean! ever-sounding Sea! Thou symbol of a drear immensity! Lashing and writhing till its strength be gone. Is a giant’s slumber, loud and deep. Or motion, yet are moved and meet in strife. Weep, and flowers sicken, when the Summer flies. And stretch thine arms, and war at once with Heaven! Thou trackless and immeasurable Main! Now softly plays upon the stream. He sinks — now every ray is fled. From Douglas to Mona Crescent. A wild, bright, wicked, diamond pair! Her words were these, and not one more? What could Diana’s motto be? As much the woman as the sand. Breathes its warmest prayer to thee. So thy love is boundless too! ADDRESS TO A STEAM BOAT. Seems, on the gleamy waves, a floating fair. Trails like a writhing serpent far behind. Of lustre, on the distant surface shine. No leave ask’st thou of either wind or tide. Had lent thee power the Ocean to command. And, all unseen, like a mask’d giant works? To gaze upon the sight with wondering eyes. ’Graves on her annals DAVY’s splendid name! They change, and veer, and turn like living things. What yet the course of ages had concealed. Ere yet the reign of letter’d lore began. To play and dally with the winds of heaven. Half sad, half proud, half angry, and half pleased. BY MISS E. S. CRAVEN. Come whispering in their dewy flight of the Valley of Glenmay. And what can sweeter thoughts to the Minstrel’s visions bring? And if thus thou art in beauty, what can e’er the charm destroy? Save the fairies in their moonlight dance when the summer day is done. Seem as they were wreaths of fairy land and left at sunrise there. As if they loved, yet fear’d to break its soft and sunny gleam. That has thrown its wild enchantment o’er the valley of Glenmay. 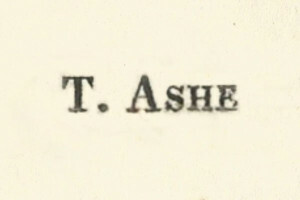 Trevor Ashe’s The Pier and Bay of Douglas, although certainly not a great work, is significant for its place amongst the earliest collections of poetry published in the Isle of Man. The collection is credited as having started the trend for ‘topographical’ poetry on the Island, naming people or their homes as locations or inspiration for the poems in the hope of gaining their patronage and boosting sales. This was to remain a popular form of poetry in the Isle of Man for almost a century, with even such 20th century works as William Gell’s Mannin Veg Veen being of the same form. The Pier and Bay of Douglas is notable for being the first publication of an Eliza Craven Green’s poem in book form. Ashe, as a friend and early advocate of the work of the later author of ‘Ellan Vannin’, included her ‘A Dream of Glenmay’ at the conclusion of the collection. Despite poems often lacking quality, perhaps leaving the reader somewhat indifferent, The Pier and Bay of Douglas still deserves its place here because of its important place in the story of Manx literature. Trevor Ashe was responsible for one of the Isle of Man’s earliest collections of poetry, its first novel, the foundation of the first “Manx Museum,” and some of the most remarkably scurrilous behaviour ever seen on the Isle of Man.